After making its official debut earlier this year, the BlackBerry KEYone finally has a launch date in the US. The BlackBerry KEYone will be released on May 31 for $549. It’ll be available unlocked initially, with models for GSM and CDMA carriers, but the KEYone will also be sold by US carriers later on. The only US carrier that’s been confirmed to be onboard with the KEYone so far is Sprint, who will sell the device this summer. The KEYone is the latest BlackBerry-branded Android smartphone. Manufactured by TCL Communication, the KEYone runs Android 7.1 on a 4.5-inch 1620×1080 display and is powered by an octa-core Snapdragon 625 processor with 3GB of RAM. It’s also packing a 12-megapixel camera with Sony IMX378 sensor, similar to the one found on the Google Pixel, and an 8-megapixel front camera. Also included is 32GB of storage, a microSD slot, and a 3505mAh battery. Also of note is the physical keyboard. 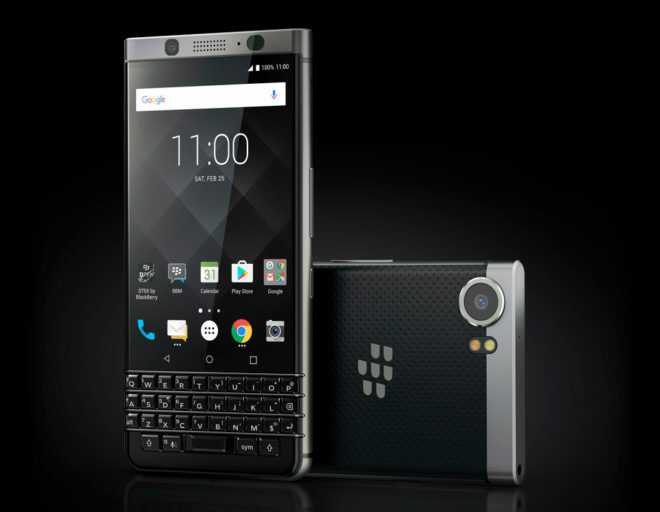 The KEYone features a full QWERTY below its display that supports keyboard shortcuts, like pressing “B” to launch the browser, and the keyboard can also function as a trackpad. There’s a fingerprint reader built into the space bar, too. We’ll have to wait and see if the BlackBerry KEYone ends up being sold by T-Mobile, but if you don’t mind buying unlocked, you’ll be able to snag a KEYone in about one month. Are you interested in the BlackBerry KEYone? Another BB hater,who don’t understand the more phones maker’s are out there the better for us buyers,right now there is really only 2 major phones makers out there,Apple,and Sammy,with lg running in 3rd place with maybe with Moto,HTC is no where to be found now,the same with Nokia is making mostly unlock phones now(with the little reviews I read about them are really good),so just think if HTC was still making phones for all 4 carriers,doing well,the same thing with Lg,and Nokia,doing really good along with BB,lets say HTC,BB,Lg,Nokia,are selling there flagship phones for anywhere from $375-$500,Sammy would have lower there prices,Apple being Apple would not. We win. I’m actually not a BB hater – Just not impressed with the hardware. Mid-range processor and display. The device is made by a 3rd party and runs Android OS. BlackBerry has lost its identity. Chris makes a good point here, which I definitely don’t think he’s being hateful at all towards BB. This device definitely is mid-range, not the higher-end form Priv was, and having a third party involved isn’t really the best thing for BB if they ever expect to be successful selling devices. Still, I think BB doing this is smarter than what HTC has been doing with their own devices. Aside from the successful deal manufacturing the Pixel for Google, HTC has made a mess of their own flagship smartphone lineup. Its to the point almost where I’d rather get a ZTE smartphone, instead of HTC, if those were the only choices available to me. I think I might even consider BB over HTC too. I know what you mean about HTC,can’t understand why they shot themselves in the foot like they did. Ok,it just every time BB brings out a new phone some people on here,deride it. ( Not saying you are.) I just can’t understand why people dislike BB so much now. I just wish BB,Noika,HTC,would get back in the game it would better for all us consumers. Yes I can see your point about BB. I also think there ought to be some mergers in the electronics industry, while still keeping this competitive enough, yet not so much that it scares away those afraid not getting enough sales. For instance, Panasonic not being involved in the U.S. market anymore. I would like for LG and Sony to merge, while Vizio buys out Blackberry, BLU, and HTC, moves all manufacturing to the U.S. to become a strong force in the U.S., and for ZTE to go away somehow, perhaps being bought ought by Vivo/Oppo, which make the OnePlus products. Very good points you have,I had no idea Panasonic were no longer in the U.S. market,now that you mention it,have not seen any of their TV in the big box stores,wow. Things really have changed for the tv market, sadly its mostly for the worst. Sure while tv resolution and pq have increased, build quality control has worsened alot. Sony still is my favorite and probably the most reliable people can get in the U.S., but even Sony has alot more potential problems than they use to. I’m not sure how Panasonic’s quality is nowadays, but they use to be near-best next to Sony in some ways, better than Sony in others. I’d really like for Panasonic to get back to selling stuff here in the U.S. again. I use to love going to their stores here, and Sony stores as well. The processor it comes with was chosen for a purpose. It is the most efficient processor in terms of battery life while still pumping out good performance. What will you do with a BB anyway, if you own one? Certainly won’t be playing games. No need for SD 835 to jack up the price here. And the display was chosen for the same reason? Why should consumers sacrifice for a longer battery life? That’s my issue here. BB is doing nothing to take market share. Making devices that only appeal to legacy end users is not a recipe for success. Do you have any issues with the iPhone 7 display? Because the BB has higher resolution and better pixel density. Like I said, BB is obviously not aiming for the mainstream with this phone. If you are interested in BB, maybe wait for one that is made for media consumption. Otherwise, there are phones for you already out there. Also, what do you think is the number one complaint on smartphones? Battery life. Even with Galaxy S8, it’s a discussion. Sony IMX378 sensor… interesting. Wondering what optics/glass are they using. Definitely interested! I hope there is some sort of promo that can bring the price down a little bit but I”m also wondering if the phone features “always listening” so I can do voice commands. My Wife would love this device. I have the Priv now, and it’s been one of my favorite phones that I’ve used in a while…up until I upgraded Android to M. Since then, it constantly overheats and slows down. I definitely want to switch to the KeyONE. I feel like it’ll be everything the Priv is but better, and while the specs don’t jump out as amazing, people need to remember why this was designed and who they’re targeting. In short, they swapped out the LED screen for an LCD, the battery is larger, the processor is known to handle multitasking better and is proven to be easier on battery life, etc. It’s obvious to me that they’ve made every decision with an eye to maximizing battery life. I’ll use my tablet for entertainment and consumption; I want this for handling my communications. The Priv has an AMOLED screen. Not just an “LED screen.” There’s a big difference.